The Allied Forces declared victory over Germany and officials signed the Armistice ending the war on November 11, 1918. Soon after, the Red Cross began to wind down their support services for the troops. 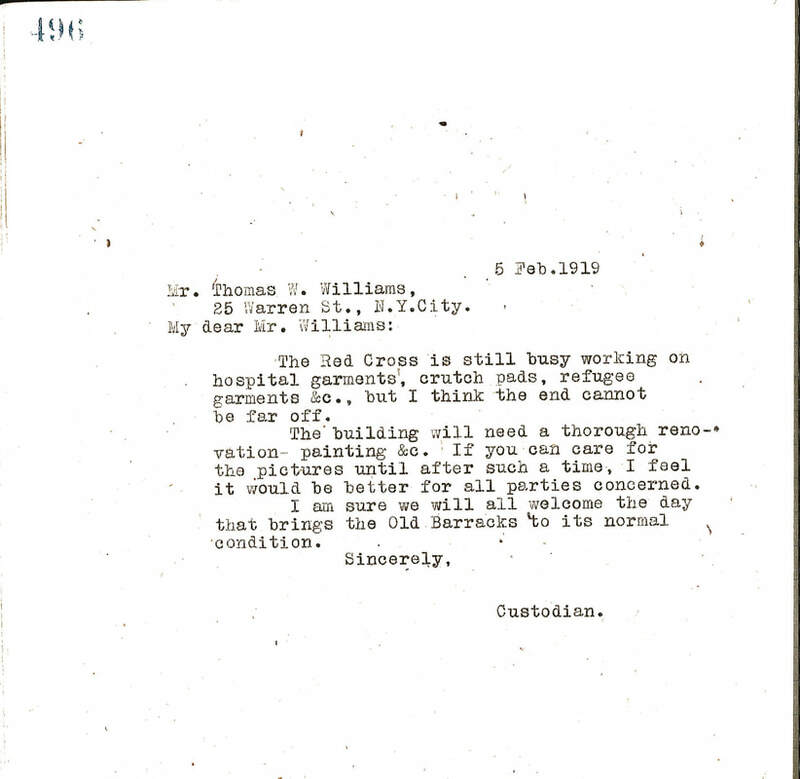 The patriotic organizations who had lent their rooms to the Red Cross anxiously waited to regain access to their spaces, as they had only been in their restored rooms for a few months before the United States entered the war. The National Society of the Sons of the American Revolution, quite keen to regain access to their meeting space, corresponded with the Association several times regarding the appearance and availability of their room after the war. 1919. Letter from Old Barracks custodian to Mr. Thomas Wright Williams, Vice General of the National Society of the Sons of the American Revolution. Archives of Old Barracks Association. Old Barracks Association meeting minutes, March 3, 1919. Archives of Old Barracks Association. Old Barracks Association meeting minutes, April 7, 1919. Archives of Old Barracks Association. be available for holding their meetings. different societies care to use them. vacate by the early part of June.